Despite it being such a commonplace material, the formation of glass is not yet fully understood. 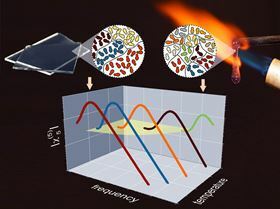 However, a new study by French and German scientists has attempted to resolve the long-standing debate over the microscopic mechanisms generating the state of matter of glass and whether it is a “real” solid – resulting from a genuine thermodynamic phase transition toward a rigid state – or a hyperviscous liquid without long-range order. While some theories claim that glass is an “ultraviscous liquid”, others argue that it is a genuine solid, with a very peculiar kind of order called “amorphous order” that drives the formation of glasses. As liquid cools, its random molecular agitation becomes less strong, while under a specific temperature, solidification results either in crystal formation that has a well-ordered and highly rigid structure, or the liquid becomes increasingly viscous, leading to the formation of glass. Glasses are stiff although their spatial organization seems without order. But could there be a hidden order in glass, and is it possible to probe the system in a state where order has been sufficiently developed to find experimental evidence? For the first time, this study, reported in Science [Albert et al. Science (2016) DOI: 10.1126/science.aaf3182], demonstrated that third- and fifth-order susceptibilities offer a definite answer. It showed experimentally the subtle form of order corresponding to collective energy optimization, and where the material structure remains spatially disordered – that is, amorphous. The team carried out two corresponding non-linear dielectric experiments on supercooled glycerol and propylene carbonate that offered strong support for theories based on thermodynamic amorphous order in glass. Although it is difficult to measure the response of glass formers to very high electric fields, it revealed the growth of compact domains across the glass transition. The emerging amorphous order is dependent on certain molecular properties only to a very small extent, suggesting that there is a more universal governing behavior of glasses. They also showed that the initiated order corresponds with a collective energy optimization, although no spatial uniformity is produced in the molecular arrangement. As researcher François Ladieu told Materials Today, “Because we know now that amorphous order develops in glasses, we better understand why, despite their extreme variety at the microscopic level, all glass forming liquids behave similarly”. However, there remains much to learn about the material, such as an increased focus on explaining the root cause of the highlighted transition phase. Windows made of transparent wood could offer more even and consistent natural lighting and better energy efficiency than glass.